I got new plates and am soooooo happy. I love my current ones, but I have more chipped/cracked plates than intact ones at this point. Mom and I were out shopping today and we decided to try and find Dinnerware Depot. They are mainly an on-line store but they have a warehouse in Sarasota that is open to the public. After a little misstep we found it (thank you Google maps!) and just had a blast looking at everything. If you buy something in the store/warehouse (i.e. it doesn’t have to be ordered) there is an additional discount. 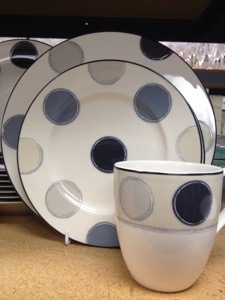 And for those who remember when I got my china, you know how much this appeals to me. So this set … I found it and just stopped. I loved it immediately. There are times when you see something and just know it is exactly what you have been looking for and is was it. I’m still not sure why I am so enamored with these, but I just love them. I did text Bob the above picture to make sure he was ok with it, and it turns out, he really, really likes them, which is good because I may have gotten a few place settings even without his ok. So I have new dishes and have begun the purge of the kitchen cabinets. But on to dinner. 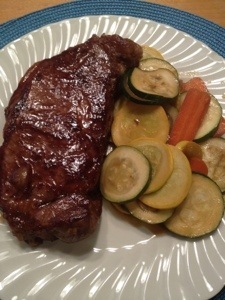 I decided to do a simple dish tonight – pan fried steak with a homemade teriyaki glaze. It turns out teriyaki sauce is super simple to make -equal parts dark soy sauce, mirin and saki. Add it to the pan when you are just about finished cooking, let it boil for a minute, turn the contents (meat or veggies – I used it for both) over and boil for another minute. The sauce turns thick and syrup-y and coats the contents nicely. This was so simple and had so much flavor without being salty like a lot of teriyaki sauces can be. A good success, and I think I liked it on the veggies as much or more than the steak we had tonight.